Hi Everyone! Have you heard yet that Winnie and Walter are having their 3rd Birthday Bash? Lots of challenges and fabulous prizes to be sure. One of the challenges is from Mayuri and is Pattern Making. I used Anna's Flora and Big Bold Friends to complete my card along with a variety of SSS dye inks. The hugs is die cut from some pearlized vellum and stacked 4 deep. I thought it went perfectly with some PPP Marshmallo sequins. Hard to see the silkiness of the die cut vellum in the photo, but it is quite cool looking IRL. My secret trick...that banner is cut from the middle of the panel mat, since I mounted it all on a white card base, no one will know...and you won't tell right? I am so fascinated with this stamp, that I have put it to use again for the Winnie and Walter 3rd Birthday Bash. 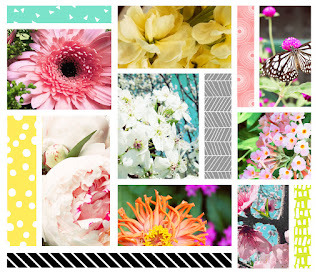 This time my inspiration was the mood board. The yellow flowers and the gray strip reminded me of one of my favorite color combinations - yellow and gray. I used water color pencils to color the roses which had been heat embossed in clear over smokey gray ink, I didn't quite want a harsh black line drawing. I added a deep yellow mat and mounted it all on a gray card base. The sentiment and diecut are also from Winnie & Walter, Big Bold Friends. It's Winnie and Walter's 3rd birthday bash, and they have so many challenges. Perfect opportunities to show off their fabulous products. This post is for Shay's challenge using 3. I used 3 shades of blue, in this card. Products used : Bed of Roses, Big Bold Friends stamps and Cut away dies. YES SUCKED IN...you know how it is when you are cruising through blog-land and you see an artist make a card and it just wow's the living daylights out of ya....and you dream that just maybe if you watch the video 4329 times you might just have a chance of casing that card reasonably well? Well, it happened to me with this Fabulous card by Sandy Allnock featuring the Hello Lovely stamp set by Concord and Ninth. I paid 24.00 USD for that stamp set, it is a larger set and has an intricate image, but for what I like to do...its one stamp and a handful of sentiments...a lot of cash when looking at my crafting budget. IT IS SO WORTH IT! I spent the day with my fellow coloring enthusiast Peggy, and we watched that video over and over and we colored. I admit to tearing up and tossing out two attempts. I don't have the copic color group Sandy used, I went with a warmer set of browns...because I had those and I had enough for some decent shading and depth. So here is my totally and absolutely cased card. I added an extra word to the sentiment, and gold dots instead of the dark ones, I mounted it as opposed to a one layer card. I'm calling my the fall version of her winter white card. After finally conquering this mono-chromatic "white" bloom; ya all know I had to go for some bright bold colors too. Here's the proof...most card goofs can be saved...I colored a bloom to the upper left in red when it should have been yellow...so I just cut that portion out. I think it makes for an interesting card. Have you ever gotten obsessed with someone's creation to the point you had to have the products and had to make one for your self? Another scramble at the Hero Arts Flickr Group, they always make for a good kick in the mojo department. LaVon was our hostess this time and she tasked us with creating a background. I used the Classic bloom Hero Arts stamp along with a sentiment from the very versatile Many Everyday Messages set. White heat embossing, brusho's for a messy look and to give it a bit of structure I made a round card mimicking the flower shapes.I used two dies from MFT,and one from Sizzix. It's a bit of whimsy. Thanks for stopping by, and hugs if you leave a comment! PS-- I'll be hosting the next scramble at the hero arts Flickr group on March 4th at noon eastern standard time. If you have Hero Arts stamps, dies, or stencils stop by and play along. My winner gets a crafty prize from me, and a second winner gets a digi stamp from Hero Arts. 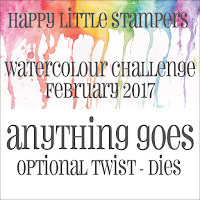 Edited to Add this to the Happy Lil Stampers Watercolour Challenge with the option of Dies. Both the card and the banner are die cut. I've not kept up on my plan to get ahead of the holiday card making. 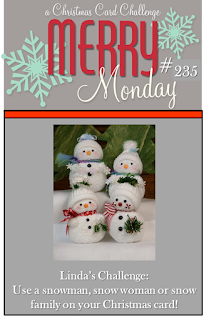 The Merry Monday challenge gave me a great reminder...and a friend gave me a snowman stamp set recently, so it's a sign, I tell ya! Some stamping and watercolor pencils makes for a fairly quick card. Stamp set is from Hampton Arts. A card for my BIL, those man cards...they take time but never look it! HA! 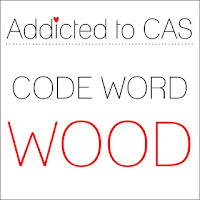 Addicted to CAS has Wood as their code word. I have a very much favorite wood grain background stamp, and when I have a man card to make it often comes out first. The stamp is by Stampin Up, as is the sentiment stamp used here. I added some watercolor pencils and then covered them with glossy accents to add some dimension. The green piece is stamped with a sentiment clear embossed over versamark...very subtle. While crafting at my dear friend Peggy's home we played with Brusho's last week. What started out as an experiment, turned into a thank you card. Peggy sent me home with the most scrumptious cranberry bars, so a card was definitely in order. I thought she would like seeing how the Brusho experiment became a card. For my bloggy friend Greta, she loves pink. I picked up a couple of Stampin Up sets from the Sale-A-Bration catalog. I generally save up my wish list for the annual buy and get sale. I used stamps from both of the sets. The flower comes from Avant Garden, and the bit of embossed lace comes from Delicate Details. I am really crushing on the lace strip. It is a photopolymer stamp, so it can be aligned to more than just a straight line. I love that it looks like a bit of lace under my main image panel. I was in a rush to mail this, days had snuck up on me...the photography suffered. Hope you had a fabulous birthday Greta! Its been quite a while...well I try to post at least twice a week and here one has gone by without a single card. I was in a funk! I hadn't even posted my Valentines. I made 3 versions and they are all below. 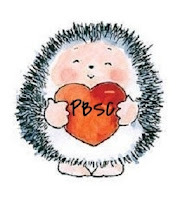 First up Penny Black's sweet dancing hedgie...how can one not smile looking at this silly happy lil hedgie? This is a new stamp for me, and I am entering the card to Penny Black's Saturday Challenge for February. Next up, Simon's Mosaic Heart, also a recent addition to my crafty stash. The background was made from a large sheet of watercolor paper colored with reds and purple brusho pigments. And lastly, my sweet lil topiary heart from Stampin Up. I made little 4bar sized cards with this one. The Each part was colored with markers in two shades and stamped multiple times...thank goodness for the Misti. 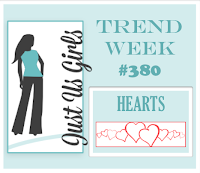 All three cards are going to Just Us Girls Trend Week Challenge - Hearts. Hi there, I finally made it over to Hero Art's Flickr group for the Hero Arts scramble hosted by Betty. She tasked us to make a card with hearts and using black and gold, a neutral white was also allowed. I used all Hero Arts stamps and Hero Arts gold embossing powder. My focus panel was die cut with a die from WPlus9. The Card Chain Challenge blog had its own home now. I've joined in for January and February after a several month absence from the challenge due to my travel schedule. I am sending my card to Lucille of White Points blog. I decided to go to go with the option of Snowflakes. I am not yet ready to let go of winter cards. The stamps are from SSS, Hero Arts and the bling is from Stampin Up. Ink was SSS and Versamark. Technique used was emboss resist. I recently got a new milwaukee heat gun. It melts the embossing powder wonderfully. It also gets very very hot. It was sliding off my table and I instinctively grabbed it...unfortunately by the hot end and burned my hand. I immediately grabbed the ice out of my drink, and went to the kitchen for the bottle of Burn Jel. This stuff is incredible and quickly takes the sting out of burns. I slathered it on. Join in the exchange, just head over to the Card Chain Challenge Blog and sign up using the linky. The theme at Simon Says Stamp's Monday Challenge Blog is Pets, and the prompt at new to me challenge Use Your Stuff is when the cat's away the mice will play - use an animal. It's been a bit of time since I took out the crazy dogs...they are so much fun. The Balloons are dies from Paper Smooches, the wonky stitches are from MFT, and the sentiment is Tim Holtz' Crazy Things. The embossing folder is from Stampin Up.